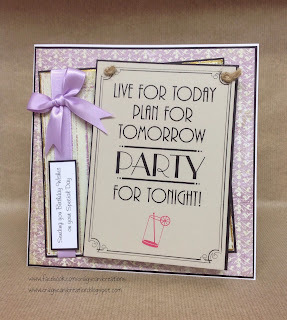 Crafting With Craig: Party for tonight card & Gift combo. Hello, Well iv been trying to think of different things to make and do, but as making cards are my passion, i wanted to make a a card that could also include something that would become a gift. I was in a High street store where i seen this plaque. Also in the back of my mind i have Stix2 magnetic discs in the back of my head as i have been wanting to create something using them too! Seeing this plaque, the idea just instantly came to mind. 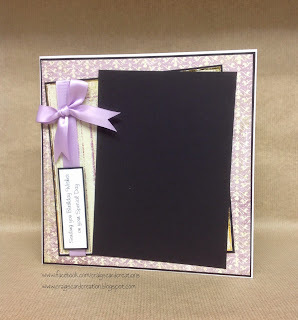 I starting off making a card but instead of using a feature image or topper, i worked around the size of a piece of black card that is a few millimeters bigger than the plaque. This will be attached to the card base and when the plaque is attached it will give it a mat and layer appearance. 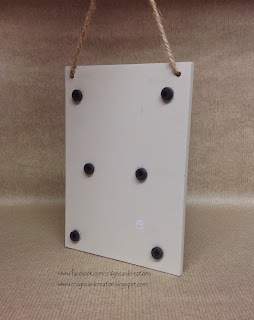 On the back of the plaque using Stix2 glue gun i have attached 6 magnet discs. On the back of those discs i attached a very small craft dot onto each magnetic disc, this enables the plaque to stick to the front of the card. The recipient once received the card can easily peel the plaque off the card and simple roll the sticky dots off using their finger. 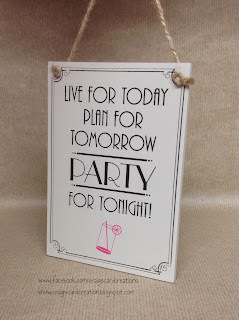 Now they have a keep sake magnetic plaque or can hang using the hanger it comes with. On the 2nd mat and layer, the one that has the ribbon wrapped round, i have gone round the edges with the PVA glue with the metal tip. I have then left it to go tacky before tapping the gold shiny foil sheet around the area. It really is something quite special and different to give to a special friend or loved one. 12mm red ultra strong tape - S57091. Hot melt glue gun - S57234. Hot melt glue sticks - S57235. Ceramic magnetic disc (x6) - S57258. Very small craft dots - S57115. Shiny transfer foil sheets (Gold) - S57067. 16mm Lilac Satin ribbon - S57214. 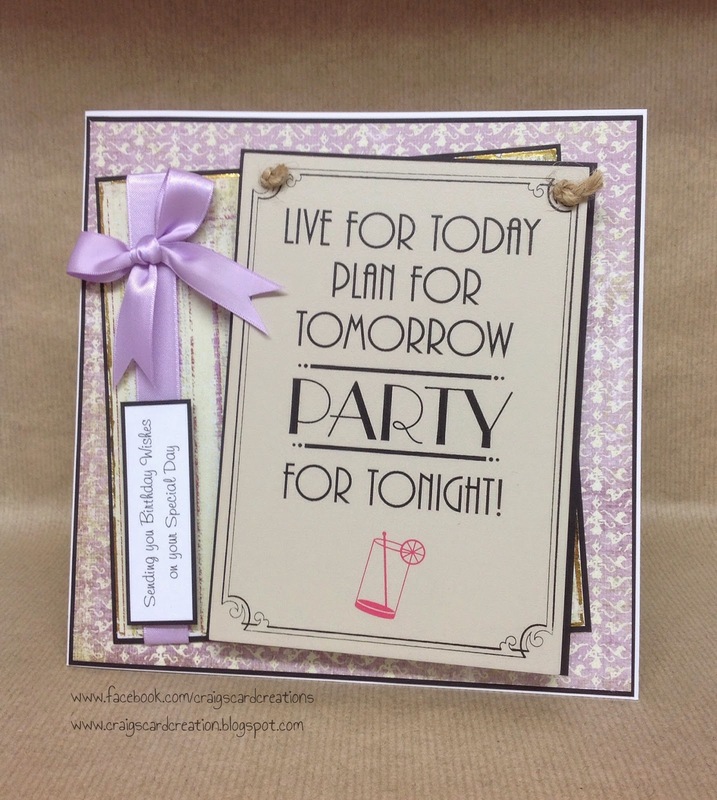 Totally girl 12x12 paper pad - My Minds Eye. 25mm Ivory Satin ribbon (for box) - American Crafts. 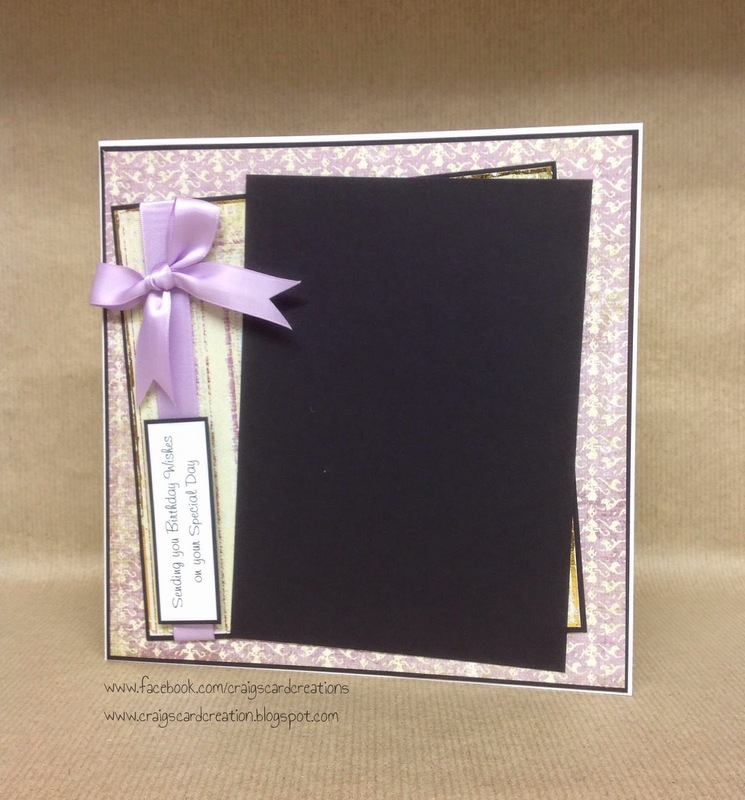 Elegance A3 card - Crafters Companion. 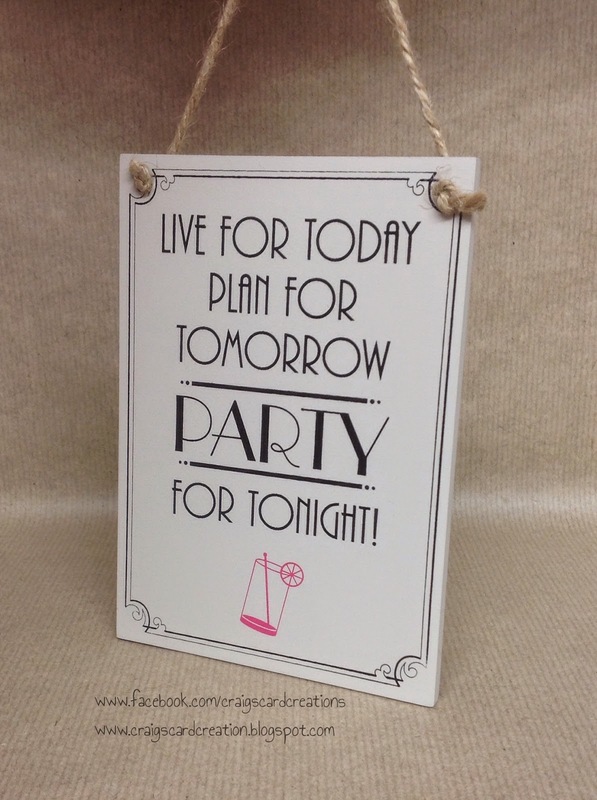 "Live for Today" plaque - high street store. 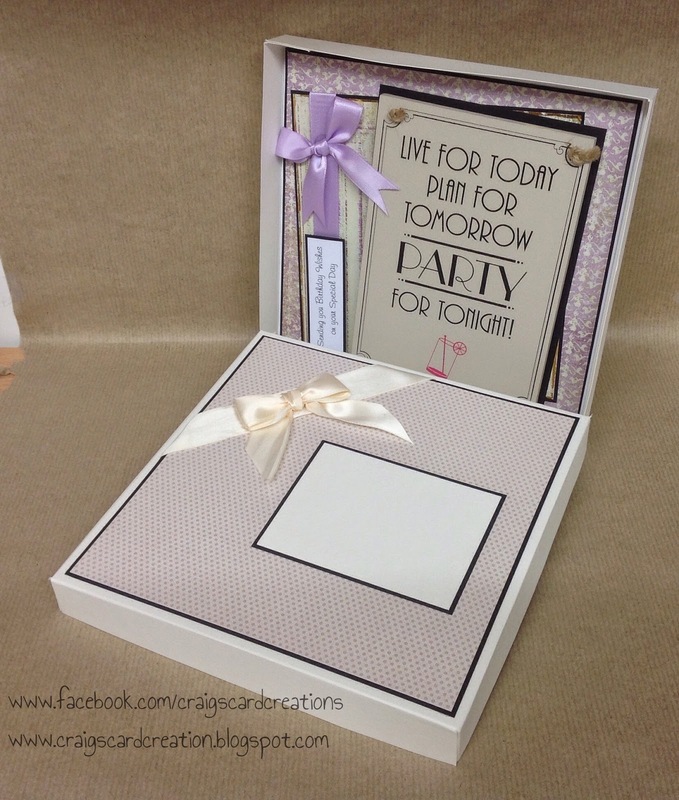 This is the finished result with the plaque attached to the card using the very small dots. This is what the card looks like without the plaque attached. This is the plaque as it could be used by hanging it. The plaque from the back with the 6 magnetic discs attached using the glue gun before the very small craft dots are attached. As it is bulky i have created a box using my large A3 scoreboard from Crafters Companion. 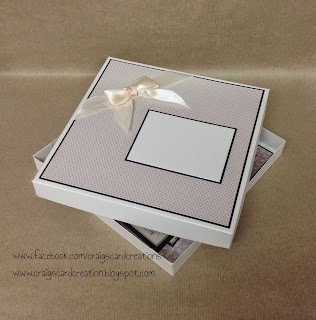 To create an 8x8 box that is 1 inch deep you will need card that is sized - 10 1/4 x 10 1/4 (Ten & a quarter x Ten & a quarter) and then score at 1" all the way around. To decorate the box i simply added some matting and layering using the A3 elegance card from Crafters Companion, black card, Ivory ribbon and a wee panel that can be written on with the recipients name.